We woke up to a less rainy, but equally as foggy, day in Arras. After we slowly trickled into breakfast, and the shock of room temperature milk and unrefrigerated eggs subsided, we tucked into our meals and freshly squeezed orange juice. As the last of us smuggled out baguettes and fruits for lunch for later today, we met in the lobby at promptly 08h30. Ready for a full day of rain, wind, and fog, we were all kitted up – a sight I’m sure looked strangle to the Frenchmen wearing just dress pants and blazers. We piled into the vans, and made our way to Hill 70. Prior to our arrival, we saw a newly erected bastille in a location once occupied by German troops. The neighboring forest still has remnants of German trench systems that were used almost a century ago. Across the street from the forest, which is being clear-cut for housing, stands a lonely memorial for the battle at Hill 70. One of two hills on either side the city of Lens, we discussed the strategic importance of the area, as well as the obstinate nature of Arthur Currie. Although the loses for the Canadians was great (roughly 10 000 men), the loss for the Germans was greater. As we were reminded, unfortunately the objective and harsh realities of the First World War was attritional warfare, and grinding down the enemy at the expense of one’s own army was an excepted consequence. By this period, 1917, we discussed the improvements made in the accuracy and technology of artillery, and how the area was another battle that adopted the bite-and-hold tactic, which the allies had been using since Passchendaele. After paying our respects, we moved towards the Lievin Communal Extension Cemetery, where Sarah gave insight into the life of trouble-maker Charles Richardson. He seemed to be cared for by all that knew him, and a true friend. From here we visited the grave of Charles B. Tinling in the Barlin Communal Cemetery Extension. Where Nina gave a presentation describing the influential Tingling family, and about his relationship with his brother. The Communal Cemetery Extensions were unique in that the area is shared with a present-day civilian cemetery; however, remain equality as peaceful and moving as those that are individual establishments. We then drove out to the Australian National Memorial in Villers-Bretonneux. The walls of the monument bear the names of roughly 11 000 ‘missing’ Australians in France from the First World War. Here we discussed the events of Spring-Summer 1918, and the role played by the Canadian and Australian troops. As a 25km rupture had been created in the Allied line by the end of April, Australian troops were brought down to push back the German advance and to protect the town of Amiens. Although the Australians were ultimately successful, the casualty were relatively high. By August, the Canadians were moved into the region, and were able to move the Germans back 13.5km in the first day. Again, despite their successes, they too suffered heavy losses. From here the day continued with sites throughout the Arras region. Although excited to see what else was in the area, some would argue that it sparked a sense of excitement for those looking to sift through a farmer’s field in search of a small fragments of shrapnel (or in Emilio’s case, and entire shell casing). Our ‘archeological’ adventure began near Rifle Wood, where were learned about the somewhat obsolete Canadian Calvary Brigade. They were able to drive the German troops into the Moreuil Wood, and eventually push back the German line. In addition, we discussed the bravery of Gordon Flowerdew of Lord Strathcona’s Horse, for which he was awarded the Victoria Cross (V.C.). From here we visited Crucifix Corner Cemetery in Villers-Brtonneux, which was unique for the large number of French-Muslim Graves, as well as that fact that two Russians were also interred. 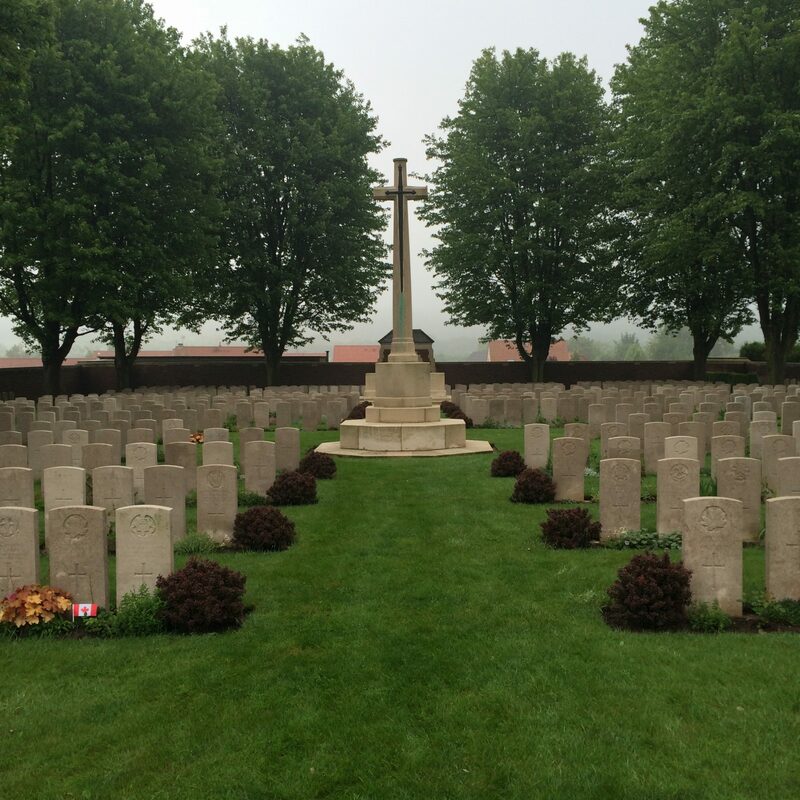 It is also the final resting place for Australians from the April 1918 battle to prevent the German capture of the city Villers-Bretonneux, as well as Canadians from the August 1918 push to drive out the Germans from the Amiens area. Finally, we visited Le Quesnel Memorial, which is in memory of the Canadians that fought in the 1918 Battle of the Amiens, particularly in Operation Llandovery Castle. The aforementioned operation was fought in memory of the HMHS Llandovery Castle – a Canadian hospital ship sunk by German U-Boats earlier in the war. Although this was intended to be the final stop in our tour, there was an almost unanimous vote to continue on to Amiens. In this case, we took the 44-minute drive along the narrow and winding roads to the ‘big city,’ Thankfully the traffic in the city stalled our arrival, and we were able to avoid the few minutes of torrential downpour we would have otherwise experienced. Upon arrival, we made our way to the Cathedrale Notre-Dame d’Amiens. Many lit a prayer candle upon entering the somber, dimly-lit church – possibly in remembrance of a soldier who shall never be forgotten.